No, this isn't that Daredevil. While he may not be the one kicking butts, taking names, and winning fans on Netflix, this Daredevil is pretty well known. He's probably one of the most-used public domain supers in various projects that make use of the resource, even working with Savage Dragon. He can be found in the Next Issue Project, Project Superpowers, and the movie Avenging Force: The Scarab, among other media. Here's his PDSH wiki entry with more details. The GRIND has an explanation of the rules system used here. Also...I promise, this'll be the last hero with a boomerang for a while...! Very cool. I remember discovering him in Project Superpowers (which was a fantastic series). Also, wow the aboriginal Australians is especially cringe worthy. I actually debated whether or not to even post that link, since it's not like I'm linking to origins for all of these characters. 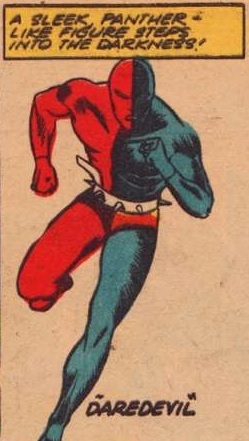 Something about Daredevil's general fame made me want to show his "official" origin, though...and I'll just count on the thought that most readers who care enough to make their way through a ridiculous Golden Age origin story have probably encountered such...um, unfortunate...portrayals before. I see nothing wrong with posting it. Yes it's bad, but it does give an interesting context to the original, plus not sharing kind of feels like glossing over things and I'm not a fan of that. Hiya! I'm Shalini and I'm on co-host Pam's Unconventional Alliance Team. Let's have a rocking April! Thanks for dropping by; good luck to you too!